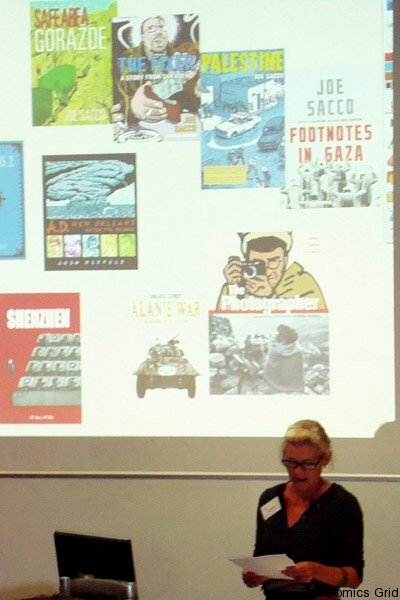 The Conference of Graphic Novels and Comics 2011 was a joint venture of three comics journals: Studies in Comics, European Comic Art and The Journal of Graphic Novels and Comics. The editors of the journals met after the 2010 conference held in Manchester, and agreed that we should work together to support the growing field of comics research. Our aim would be to hold a comics conference or symposium each year at different venues and tie in the journals with current debate in the field. The number and quality of papers submitted to the conference were a pleasant surprise – we got submissions from international and key comics researchers such as Charles Hatfield, Bart Beaty, Martin Barker, Mel Gibson and some excellent submissions from upcoming scholars. In total, there were nearly 100 presentations over four days – double the size of the previous conference. Luckily our team, Mat Screech (European Comic Art), Chris Murray and Julia Round (Studies in Comics), Dave Huxley and myself (Journal of Graphic Novels and Comics) worked fairly efficiently despite geographical distance. Dave produced some attractive posters (see above) as usual. Between us we all managed to scrape together pots of money from our respective institutions, departments and journals to underwrite the conference. We also had great support from Travelling Man and Forbidden Planet which both featured the conference on their websites. 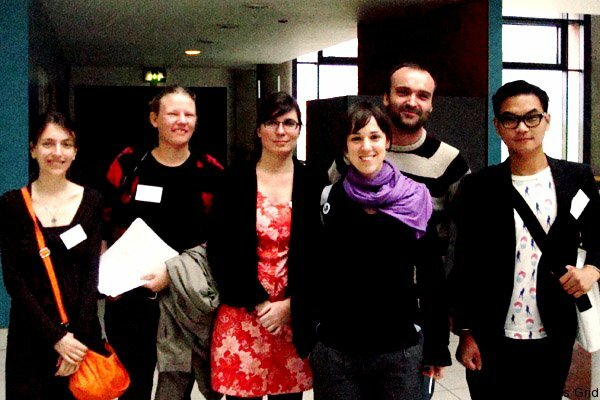 Renata Pascoal, Rikke Platz Cortsen, Greice Schneider, Esther Claudio, Roberto Bartual and Jimenez Lai, Manchester 2011. Photo courtesy of Greice Schneider at http://www.comicsgrid.com/. There were three strands: audiences and readership suggested by 2010’s keynote Martin Barker, creators and small press and the bande dessinée strand on time and space. 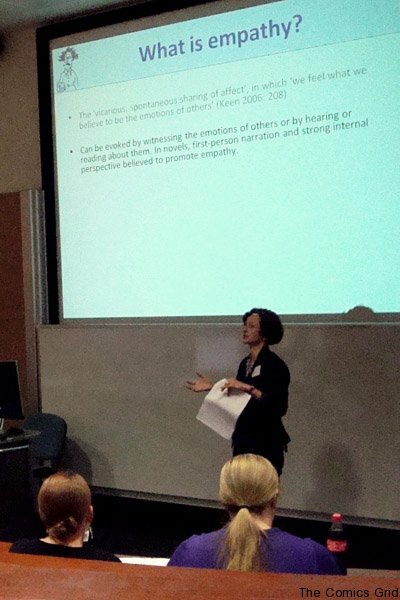 To ensure the conference was fully inclusive, we also held open sessions for researchers whose work fell outside the conference themes. For instance there was an excellent panel on audiences and empathy from Ian Williams, Elisabeth el Refaie and Esther Claudio Moreno which focused on medical issues. 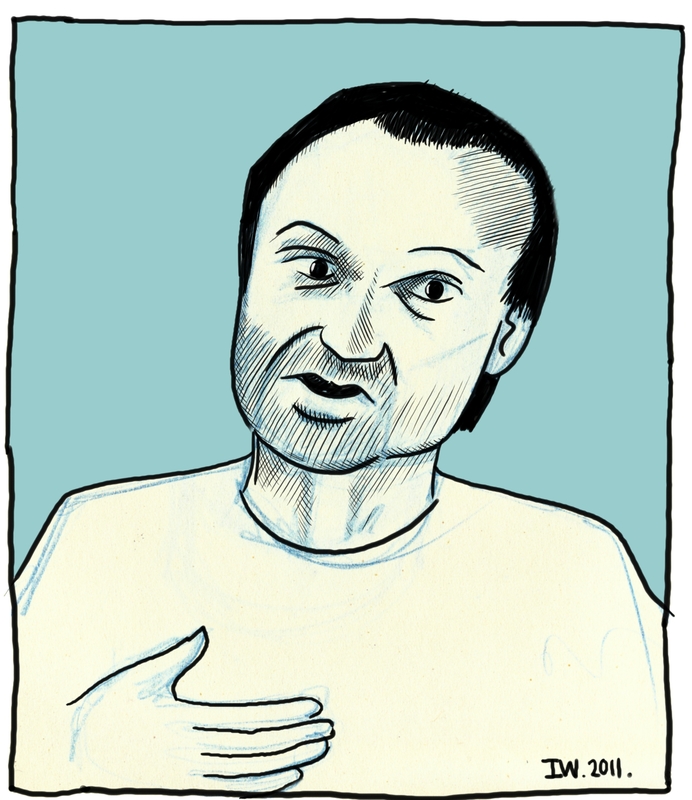 Our keynotes in the audiences and readership/creators and small press were Hunt Emerson whose presentation, ’35 Years of Big Noses’ recounted his work adapting poetry such as Coleridge’s ‘The Rime of the Ancient Mariner’ into graphic novel. Hunt also showed us his Bash Street Kids version of Shelley’s ‘Ozymadias’ which, surprisingly was published in the Beano. The second keynote, Melinda Gebbie gave an impassioned speech about the function of comics beyond the endless revamping of the superhero. Her aim was to provoke a debate about the role of comics as inspirational rather than as just entertainment. As yet no clear analytical paradigm for comics has emerged – and the range of eclectic approaches to the comics field from semiotics to psycho-geography, Jungian analysis to narratology, reflected this. For instance, Roberto Bartual examined time and narrative in long running serials and series such as Peanuts and Gasoline Alley. These two cartoon strips with their themes of childhood and family deal with time in quite different ways. Peanuts is a series – the stories are self-contained, characters have no memories of past events. Time is expressed through the seasons – Valentine’s Day, Christmas, Easter. Gasoline Alley, however is a serial, there is no closure and the characters grow older. Bartual argued that these expressions of time not only hail the reader but they share similarities with cinematic duration. The audiences and readership strands, to me, were particularly interesting. Simon Locke’s rethinking of the fanboy as a revolutionary category began by challenging previous fan studies which, he argued, tended to treat the fan boy as either an industrial invention or a media dupe. Using categorization analysis, Locke demonstrated that subcultural participation should be analysed to show internal conflicts by highlighting the diversity of practices and rhetoric. Fanboy is then shown to be a site of constant reinvention. Locke’s take on subcultural rhetoric has provided me with some new insight that I’ll be using in my other work in surfing subcultures. Ben Woo recounted the results of his ethnographic research into the subcultural meaning of spaces in a comic book store, ‘The Android’s Dungeon’. Drawing upon Bourdieu and Goffman, Woo illustrated the importance of analysing the experience of readership within its social settings. Ian Gordon’s meticulous random survey of long term fans and 1960s letters pages of Action Comics identified how seven or eight writers were continuously published. He traced the careers of these fans to discover that most had some influence on the comics industry. 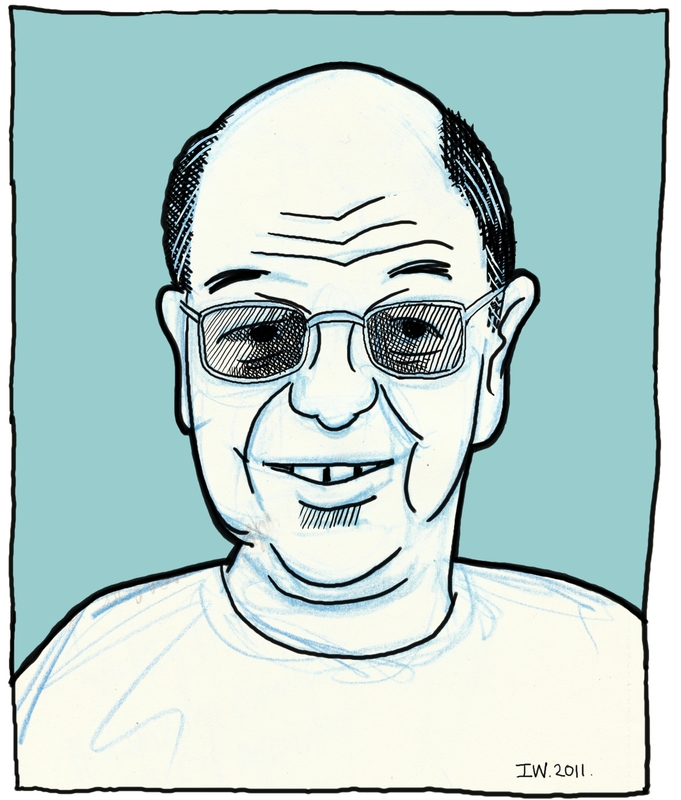 He noted, for instance the career of Fred Hembeck (one of my favourites), a self-published comics creator, humourist and commentator of comics. Elizabeth el Refaie, Manchester 2011. Photo courtesy of Greice Schneider at http://www.comicsgrid.com/. In a panel on gender Mel Gibson gave a provocative talk on the disparity in the treatment between reprints of boys and girls comics where editorials in titles such as Mum’s Own Annual invite mockery of past girlhoods. Sarah Zaidan demonstrated her MetaMan software programme which maps the development of masculinity through superhero representations in different eras. What was interesting about this talk was in her use of the software as a teaching tool. Unfortunately it’s impossible to hear all the papers that appeal to you when there are multiple strands and you are chairing so my account of the conference is not fully inclusive. I’m, therefore, interested in hearing comments from participants on the papers they enjoyed. 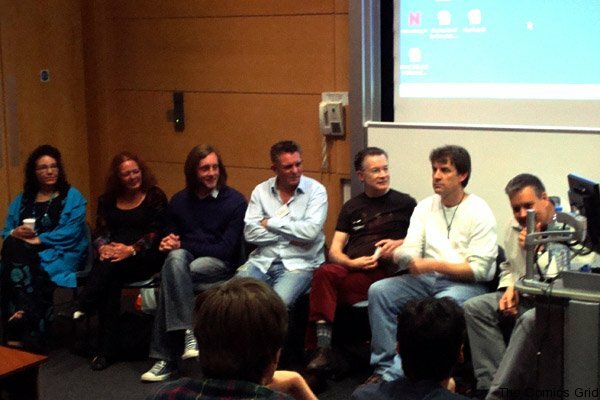 Melinda Gebbie, Mel Gibson, Ian Hague, Laurence Grove, Paul Gravett, Charles Hatfield and Roger Sabin, Manchester 2011. Photo courtesy of Greice Schneider at http://www.comicsgrid.com/. One of our other aims was for any delegates who would like their papers considered for publication to submit them to the journals. The profile of the journals is as follows: Studies in Comics is interested in papers that examine comics as form and the analysis of comics, The Journal of Graphic Novels and Comics is interested in the cultural and historical construction of comics and graphic novels and European Comic Art examines bande dessinée. Our advice is that you submit your work to the journal you consider most appropriate. Nina Mickwitz, Manchester 2011. Photo courtesy of Greice Schneider at http://www.comicsgrid.com/. As noted above, we plan to continue holding either a conference or symposium every year. At the risk of injecting politics into this report, we’re working in a time when the Humanities and well established fields such as Film Studies are under attack in Higher Education. It is, therefore, important for researchers and publications to collaborate and strengthen work in the comics field. Events such as Thought Bubble and Comics Forum are great platforms for writing and debate. Before the end of this year’s conference we planned next year’s event as a two day symposium at Bournemouth. Taking the main theme of education and comics discussed in the roundtable at the close of this year’s conference, next year we’ll deal with education and adaptation – watch this space for the calls for papers. 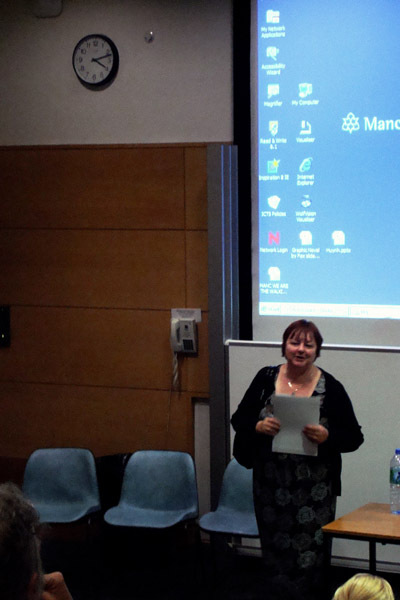 Joan Ormrod, Manchester 2011. Photo courtesy of Greice Schneider at http://www.comicsgrid.com/. Joan Ormrod is a senior lecturer in Media at Manchester Metropolitan University, where she teaches graphic novels and comics with Dave Huxley. She and Dave also co-edit Routledge’s Journal of Graphic Novels and Comics. Her areas of research are in representations and audiences of gender in comics and comics form and narrative. Forthcoming publications concern the adaptations of Edgar Allan Poe in comics and marketing ephemera and masculinities in vampire fandom. In past conferences she has presented papers on UK girls romance comics from the 1950s and ’60s and representing women superheroes. For more images from Manchester 2011, click here. 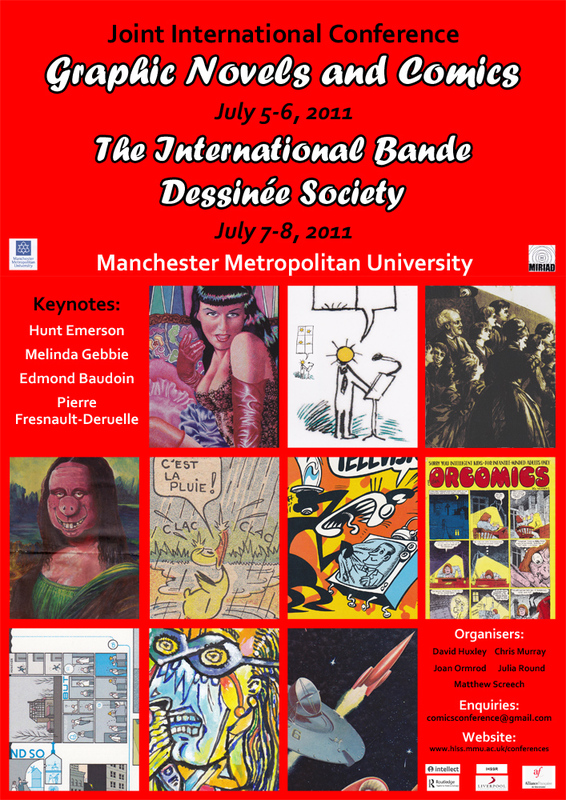 The Joint International Conference was also the International Bande Dessinée Society’s seventh international conference; a full report on this side of things is forthcoming. The eighth IBDS conference is scheduled for 2013.